Augmented Reality in Logistics: Just an interesting test or reality soon? Madrid, Feb 06, 2015.- Technological innovations in information systems for mobile devices are now coming faster to the Supply Chain. The picking is one of the critical logistics activities in a warehouse. Picking need to register 100% correct answers in the shortest time possible. 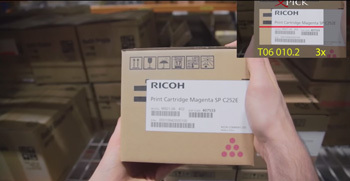 Today we report an interesting test with augmented reality picking DHL for Ricoh. Documentation, video and graphics have been developed by DHL and we show that there is still room Supply Chain to innovate new methods, new information systems, new solutions to optimize. DHL has successfully carried out a pilot project testing smart glasses and augmented reality in a warehouse in the Netherlands. 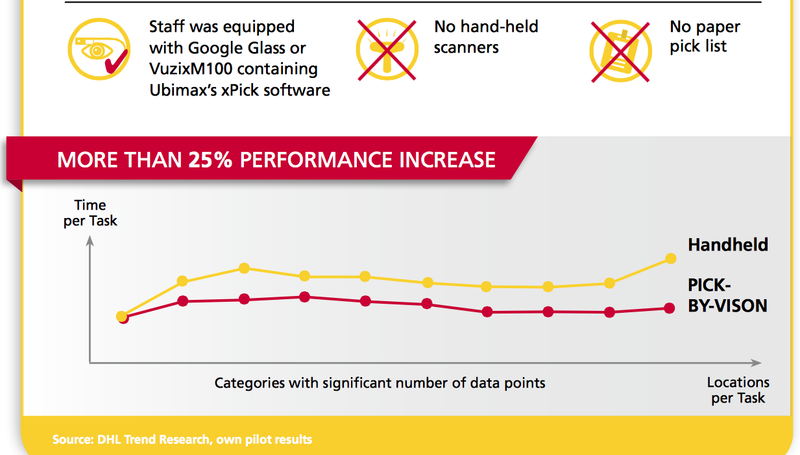 In cooperation with DHL customer Ricoh and wearable computing solutions expert Ubimax, the technology was used to implement ‘vision picking’ in warehousing operations. Staff was guided through the warehouse by graphics displayed on the smart glass to speed up the picking process and reduce errors. The pilot proved that augmented reality offers added value to logistics and resulted in a 25 percent efficiency increase during the picking process. “Vision picking enables hands free order picking and greatly increases productivity. The technology significantly supports our staff and brings exciting value to our customers. However, this is just the first step in our innovation journey as we believe augmented reality will become relevant for even more supply chain areas“, says Jan-Willem De Jong, Business Unit Director Technology, DHL Supply Chain Benelux. The pilot’s objective was to gain insights on the technology’s benefits and limitations. 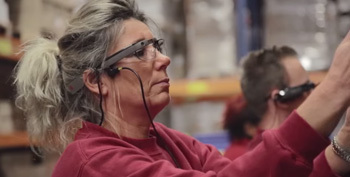 For three weeks, warehouse staff in Bergen op Zoom was equipped with head mounted displays such as Google Glass and VuzixM100. The displays showed the respective task information during the picking process, including aisle, product location and quantity. Overall, 10 order pickers used the equipment and picked more than 20,000 items, fulfilling 9,000 orders within the given time frame. As a result, staff was able to operate much faster and error free. Currently, DHL and Ricoh are jointly evaluating the roll-out of the solution. “We are always looking to further improve our processes with new technologies and we were happy to have DHL as our innovation partner for the pilot project”, says Pieter-Jelle van Dijk, Director Operations, Ricoh EMEA. 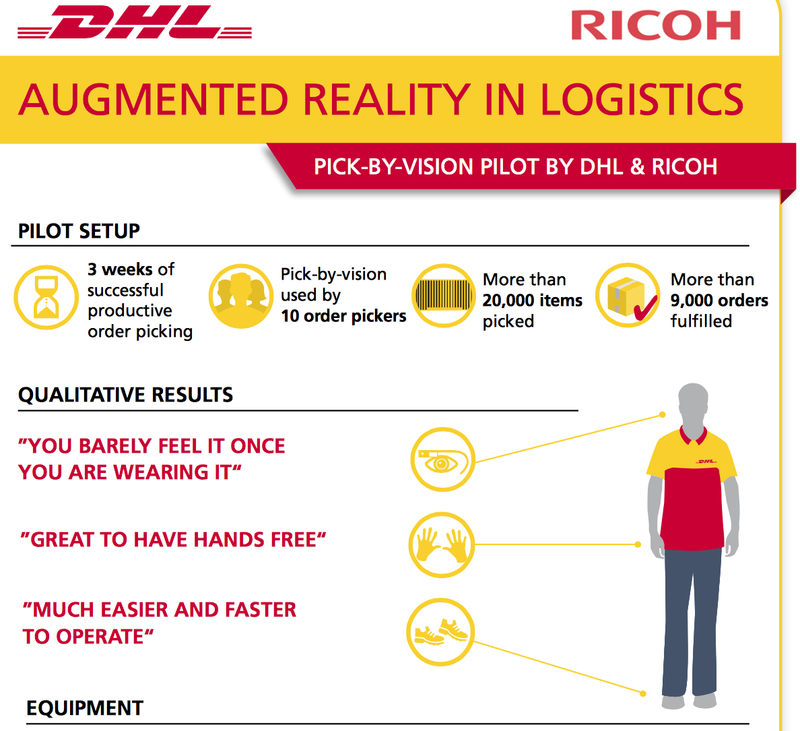 In June 2014, DHL´s Trend Research team issued a trend report called “Augmented Reality in Logistics”, which describes best practices and promising use cases. In addition to vision picking in warehousing operations, the report also illustrates how operations during transportation, last mile delivery and value-added services could be improved by augmented reality applications. For the near future, DHL is looking forward to explore the economic feasibility of augmented reality in additional areas and is open for collaboration with further partners. And the Google Glass augmented reality and we go to the holographic technology presented recently by Microsoft for Windows10 operating system. It will tell if this technology eventually sold to all consumers. And later, if you manufacture a version for the Supply Chain. For now, the demo presentation is very attractive.